Rotary Youth Exchange provides unique opportunities to experience first-hand the cultures of different countries and a new way of life. Often, exchange students will make life-long friendships with their host families, Rotarians and fellow exchange students they meet. The program aims to build peace by developing young people into truly global citizens. 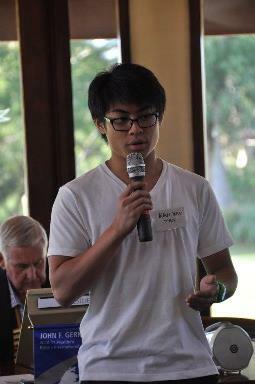 As a Rotary youth exchange student, you would spend up to 12 months living and studying overseas. During your exchange you would learn a lot about yourself, the culture of your adopted host families, the diversity of your host country and, depending on where you stay, often a new language too. Exchange students are usually aged between 17 and 19. Contact the Club to find out more about what life-changing opportunities are available and the application process. As well as helping young Western Australians to go abroad, Scarborough Rotary has a longstanding tradition of hosting foreign exchange students in Perth. The Club has a unique link with Churchlands Senior High School, with in-coming exchange students attending the school during their year in Perth.amazing, life-changing experience. Our current inbound exchange student is Flynn. The Scarborough Rotary Club has strong links with the local Churchlands High School on many levels. To support students with a passion for the environment Scarborough Rotary supports the students’ to make a diﬀerence through their Trees for Survival project, which raises native seedlings. The students can then attend camps and day trips to plant the young trees they’ve grown on farms in the Wheatbelt and in the urban environment. 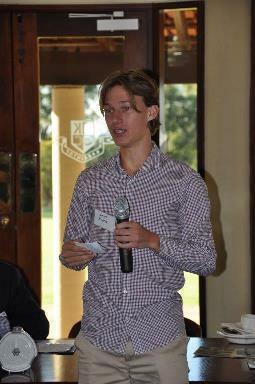 The Club’s in-coming exchange students also attend the school during their year in Perth. Scarborough Rotary supports young people to develop their ability to speak publicly on topics that matter to them, fostering excellence in the art of public speaking. The Rotary speaking competition allows Year 10 students the opportunity to compete in public speaking, providing an opportunity for them to test their skills before an audience whilst developing their confidence and self-esteem. In 2017 Scarborough Rotary had three students present to the Club and the winner, Miriam Dabbs, was selected to go on to speak at the District Semi Final competition. The Leeuwin Ocean Adventure Foundation facilitates week-long Youth Explorer Voyages on the sailing vessel STS Leeuwin II for young people aged between 14 and 25. Scarborough Rotary sponsored two students from Churchlands SHS, Liam Birch and Ashleigh Pauls, to take part in their life-changing voyages in December 2016. The voyages cater for individuals from all walks of life and include programs designed to help young people build self-confidence, communication, teamwork and leadership skills, which are important for future education and employment. A student who went on a past voyage said: "I really loved the challenging aspect of it, which helped me to grow as a person and become more independent, responsible and confident. I learned to be more decisive and also improved my communication and teamwork skills." The Rotary Youth Leadership Award (RYLA) is a challenging 7 day program providing a unique opportunity for leadership-skill development. Rotary seeks young people between the ages of 18 and 28 from diverse backgrounds who have the talent, energy and motivation to discover their leadership potential. Whether they are a secondary school student, university student, or young professional, RYLA provides a unique opportunity to learn, grow, have fun, and make new friends. In 2017 Scarborough Rotary sponsored two students on this week-long leadership camp: Kah Yen Tan from Churchlands Senior High School (left) and Sam King from Carine Senior High School (right). RYPEN is a youth leadership conference for young people aged between 15 and 17 that attend Year 9 to Year 11. The conference is a weekend camp designed at developing young people’s potential through a mixture of lecture style sessions and adventure-based learning. RYPEN aims to communicate a series of ideas, problems and social experiences to young people to assist in forming their own values and moral standards, and help them broaden their cultural, social and academic horizons. In May 2017 Scarborough Rotary sponsored two students from Churchlands SHS – Sofie Kerr and Marcus Grainger. Scarborough Rotary has had a strong link with this Karrinyup school for many years. In 2016 they requested support for a fundraising movie night for the School P&C. The Club provided financial support to hire a fundraising movie, with all revenue raised going to the school. Scarborough Rotary was approached to support a very special young lady, Vanessa Vlajkovic, who is both deaf and blind.. Vanessa was the 2016 WA Young Person of the Year and the first deafblind person in WA to enter university. Vanessa had been invited to present at an International Conference in Denmark, however, this was unfortunately to be at her own cost, which was significant as she needed to take an interpreter as well as an aide. The overall cost was about $ 10,000. The Osborne Park Rotary Club and the Scarborough Rotary Club agreed to financially support Vanessa so she could contribute her story at this important world event. Life Education provides a unique learning experience for children instilling in them the skills needed to make informed decisions about their health and wellbeing. 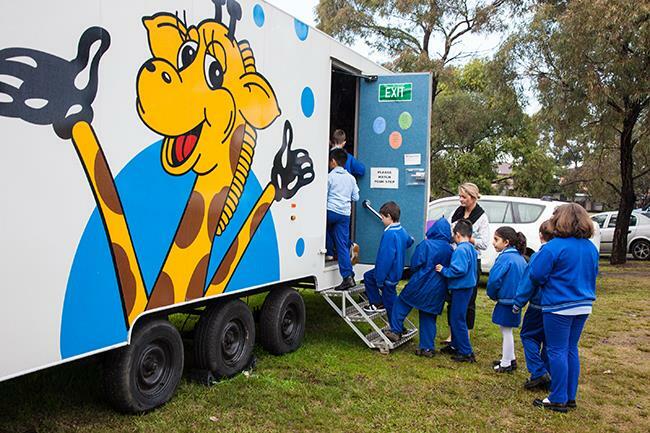 Life Education mobile classrooms and qualified staff visit primary schools to raise drug awareness with the children. joined by Life Education’s loveable mascot Healthy Harold. Scarborough Rotary Club has supported this fabulous program for many years.